Each year, about 6 million new cancer diagnoses are made in dogs, with a similar number in cats. Fortunately, we’ve seen great advancements in medicine over the years, which allow veterinarians to diagnose and treat cancer with greater success. Early detection is crucial when it comes to pet cancer. As pet owners ourselves, we understand that your pet is a much-loved member of the family. We encourage you to be vigilant about your pet’s health. Cancer is the number one cause of disease-related deaths in older cats and dogs, and finding it early can make all the difference. For young and adult pets, schedule annual visits with your family veterinarian for a full checkup. For older or senior pets, schedule checkups every six months. Animals age at a faster rate than humans do, so even though it may be one year in our time, it may be equivalent to several years for them. Be observant to any changes in your pet’s physical appearance and behavior. We talked about some of the signs and symptoms of brain cancer in a previous post—one common sign being seizures. However, not all warning signs are that obvious. Here are the top 10 warning signs of cancer in cats and dogs, adapted from the American Veterinary Medical Association. If you notice any of these, contact your veterinarian to check things out as soon as possible. Depending on the cancer type and stage, your pet’s health can deteriorate very quickly, so it’s always best to get an exam. When in doubt, get it checked out. Once or twice a month, take a few minutes to feel your pet’s body for any lumps, bumps or abnormal swelling. Check for swollen lymph nodes, which can be a sign of lymphoma. Lymph nodes are located throughout the body but most easily detected around the jaw, shoulders, armpits, and behind the legs. Make a note of any bumps (their size and location) to make sure they aren’t growing or changing shape over time. Here is a helpful video on how to check for lumps and bumps. Questions about pet cancer? Call us. If your pet has been recently diagnosed with cancer, we are here to help. PetCure Oncology has a rapid-response center for pet parents like you who may be struggling with a dog or cat’s cancer diagnosis. Our full-time Pet Advocate Team is trained and ready to receive your phone calls with knowledge and compassion. 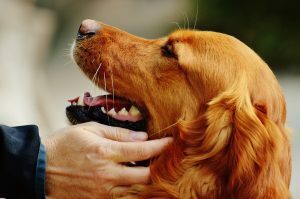 They will help you understand the nature of your pet’s cancer diagnosis, discuss treatment options, and connect you with educational resources to better manage your pet’s care.